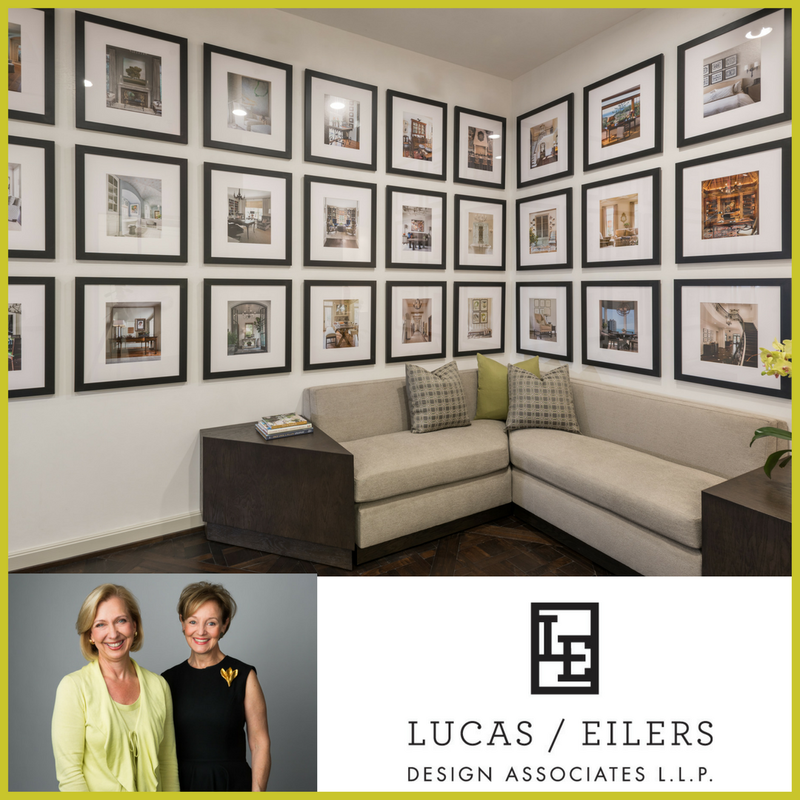 Today, dear readers, we are excited to bring you the final installment of our 6 part series on “The Inspiring Workspaces of America’s Top Designers”, featuring our exclusive interview with the Houston based design team of Sandy Lucas and Sarah Brooks Eilers, founders of Lucas Eilers Design Associates, LLP. 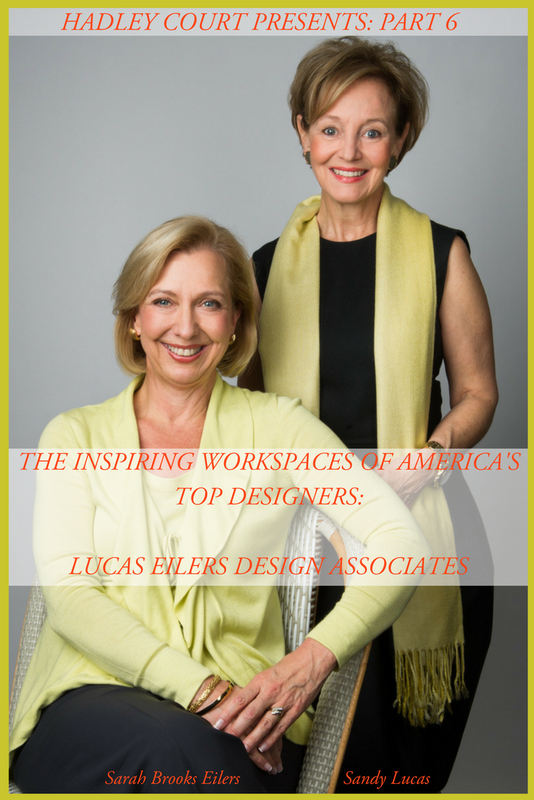 Sarah and Sandy founded their firm 23 years ago and today they employ a team of 8 additional designers. 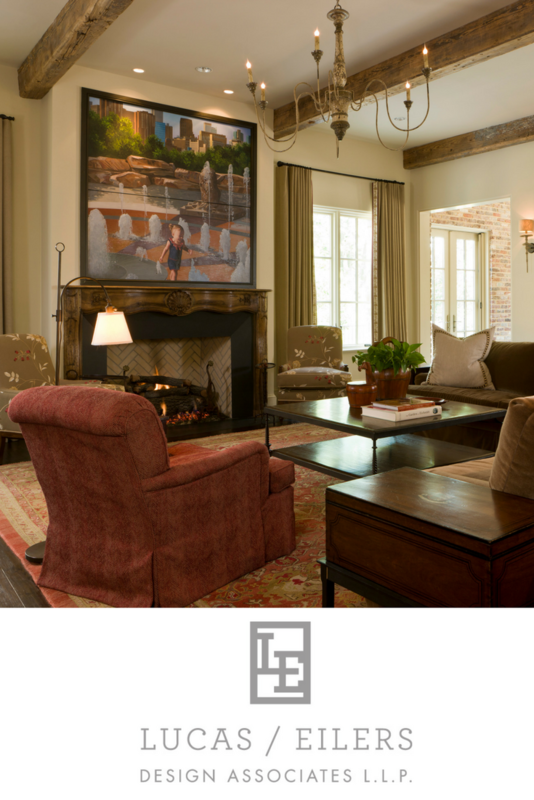 They are well known for their mixing of antiques (many of which they find at Texas’ own Round Top Antiques Fair ), with their client’s art collections, to create warm, inviting, beautifully edited rooms that never go out of style. Two examples are below. 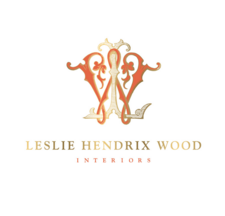 Their interior design work has been featured in Traditional Home magazine, Luxe Magazine and many other national, regional and local publications and they are the recipient of numerous ASID design awards. 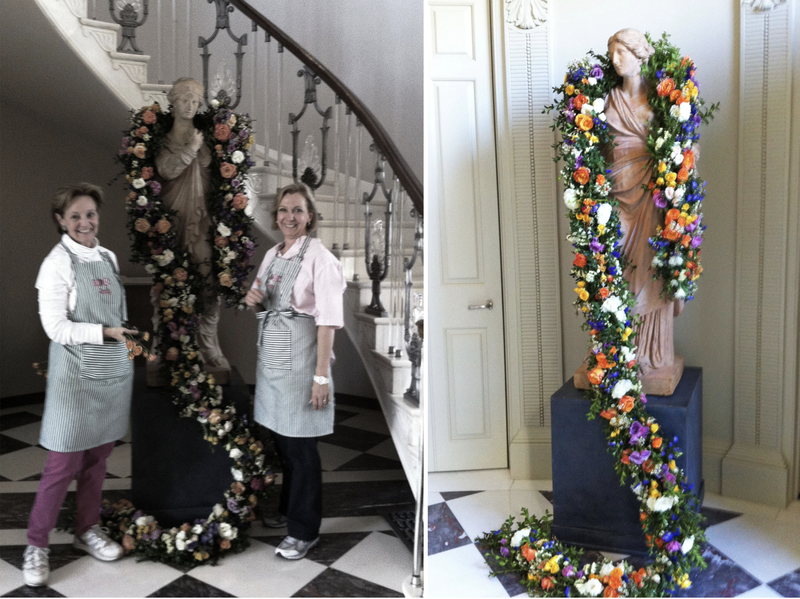 In addition, Sarah and Sandy are both members of Design Trust, Ltd, where Sarah was the recent past President. Design Trust, LTD is a carefully selected consortium of luxury principal interior designers advising brands like Kravet, etc. 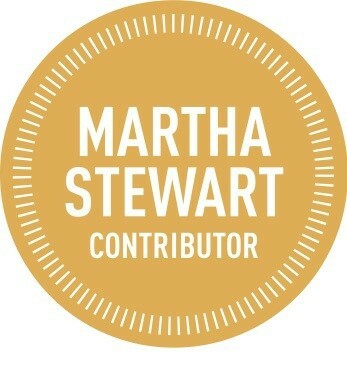 We are thrilled to be able to show you, in the balance of this post, their beautiful offices and their answers to our interview questions about how they designed their offices, the branded presentation materials they use, etc. HADLEY COURT: What does your office look like? Where is it located? What did you take into consideration when you were designing it? 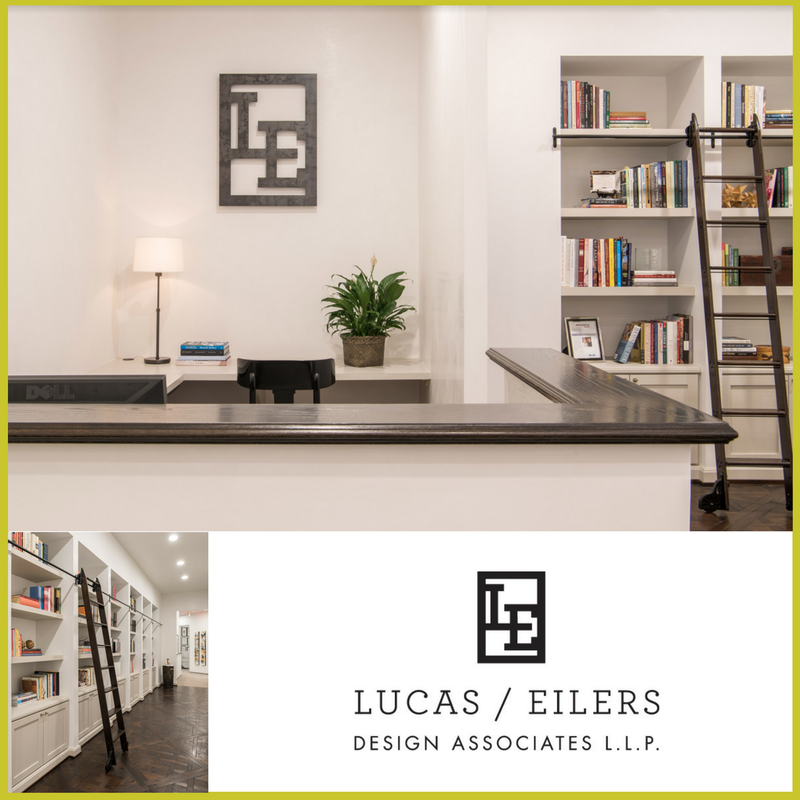 L/E: We purposely kept the design of our new offices very simple and professional. 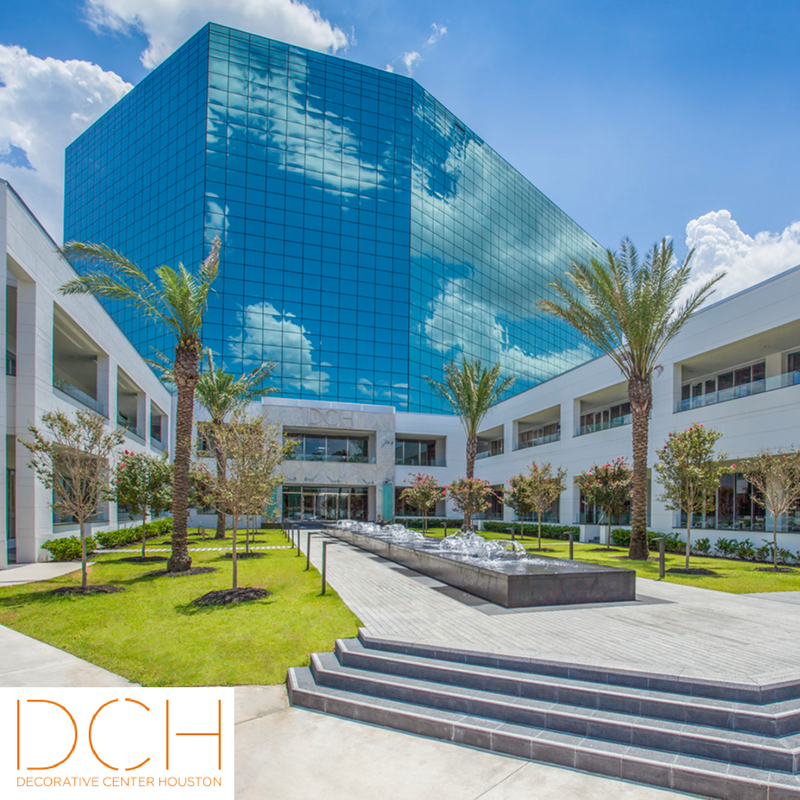 We moved from an office that was closer to our own homes, to offices at the Decorative Center of Houston, last year. 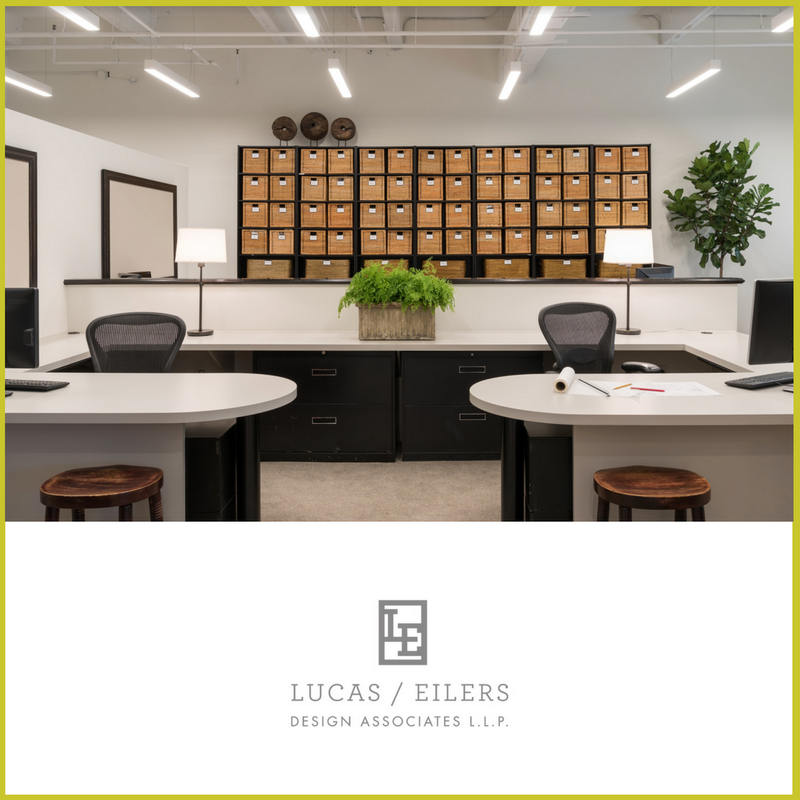 The clean lines and neutral colors we chose for our new offices easily complement any design project we are working on; regardless if it is traditional or contemporary. Below is the entrance. The walls and ceilings of the front areas are white plaster and the floors are hand scraped walnut in a diagonal pattern. Two walls display photos of past projects to show clients examples of our work. This is our reception area. The logo was hand forged for us. 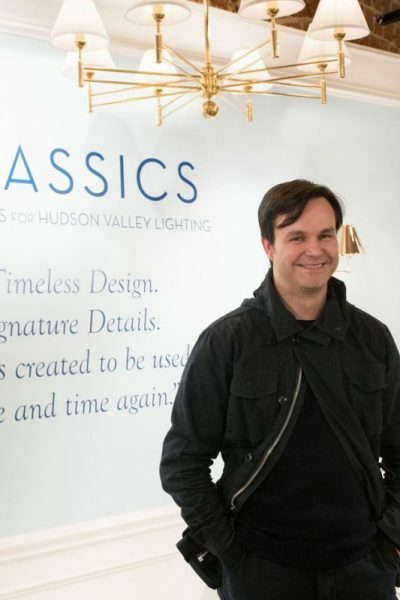 We believe in supporting artisanal makers whenever we can and often custom design hand forged metal furniture, lighting, frames and accessories in our work for our clients. Our designer’s workspaces are open to one another to encourage teamwork and collaboration. One of the things that attracted us to our space was the high ceilings. The 11′ ceiling height in the main areas gives a lovely feeling of spaciousness to our clients when they come to our offices for their presentations and the 13′ ceilings in our work areas assures all of us who work together everyday that we never feel crowded. The most popular spot in our office is our kitchen/break room. A long comfortable banquet with cafe tables and chairs is nestled behind a custom wooden triangular column to create a place to gather for lunch or for brainstorming on projects. A large magnetic tack surface in this space displays invitations and announcements to keep everyone up to date on what’s going on. HADLEY COURT: How do you set the mood for a client presentation? L/E: We designed our workspaces with two presentation/conference rooms. 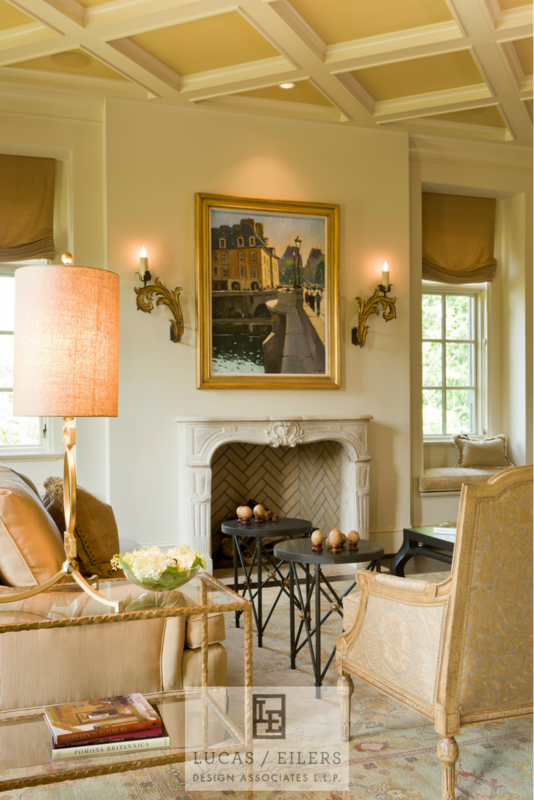 Each one has 3 walls covered in a neutral Kravet linen tackable surface for displaying images of furnishings, fabrics, lighting, art and accessories. An ebony wood stained ledge below the fabric tack surface holds heavier samples like tile, wood and marble slabs. 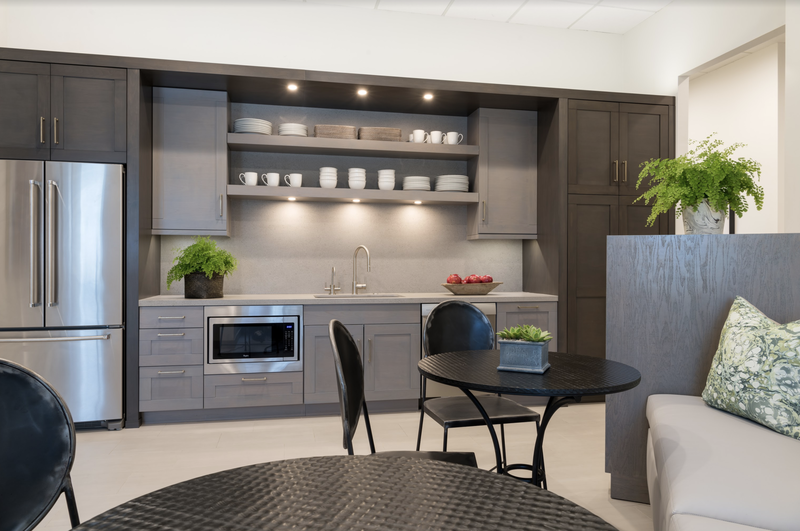 The focal point of each presentation room is a black niche with a large flat screen TV which is used to present AutoCAD furniture plans, elevations and detailed architectural drawings, as well as to search websites, when needed. Proper lighting is provided by color corrected LED recessed cans along with custom white linen pendants. 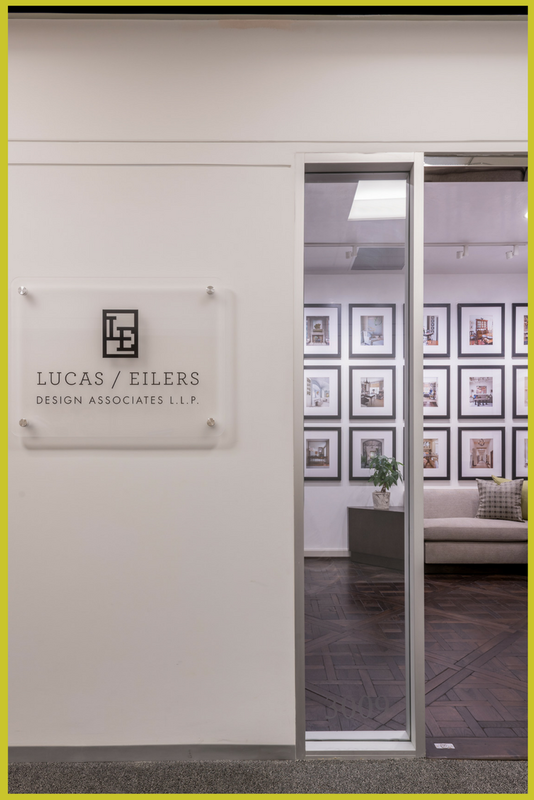 We enjoy having our clients walk down this hallway, before they enter our presentation room, and it sets the tone for what we represent as designers. We always serve a light breakfast for our out of town clients and order in lunch for our later meetings. In addition, our clients are always welcome to anything in our well stocked pantry and refrigerator. 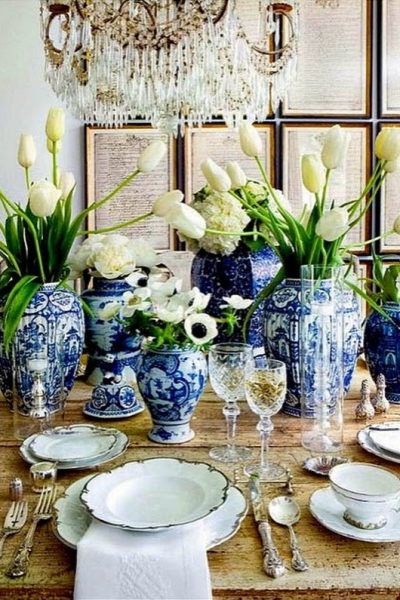 Sandy and I have done many beautiful flower arrangements for homes on the Azalea Trail over the years, sponsored by the River Oaks Garden Club, and fresh flowers are essential to us in setting the *right* mood for our presentations. 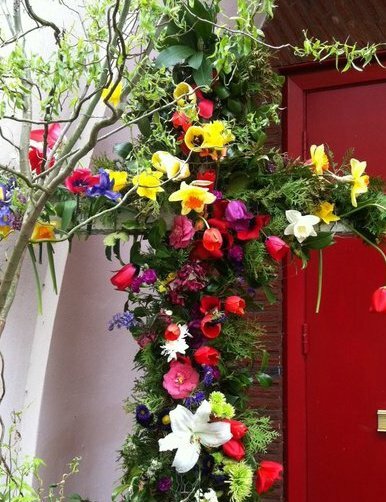 However, we are careful to not use heavily scented flowers, as some people are allergic to certain smells. HADLEY COURT: What branded materials do you use in your presentations? L/E: We have branded folders that we typically use to present our letters of agreement, along with printed marketing materials and stationery, but lately we have found ourselves moving away from printed materials in an effort to be more sustainable. HADLEY COURT: How do you use online tools in your presentations? 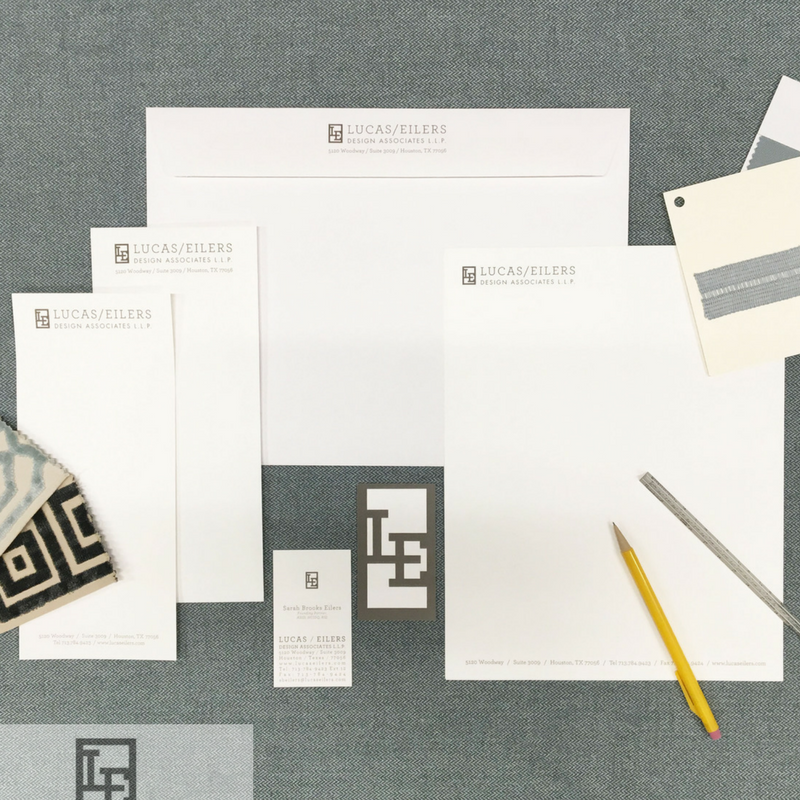 L/E: We sometimes use Power Point for client presentations, although the majority of the time we like to have the plans and furniture selections printed and pinned to our tackable boards, along with the physical finish and fabric samples for our clients to see and touch. Internally, we use a project management software called Basecamp that is accessed via the cloud, which allows our entire team to keep up with our projects on an hourly basis, even when we’re travelling for out of state clients. When we have meetings outside the office, we always have our IPad and/or are IPhone to take notes and use for research. 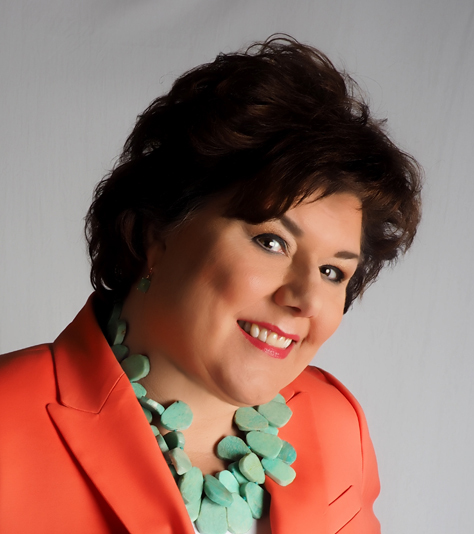 HADLEY COURT: Which presentation materials do you give to your clients, once the presentation is complete? 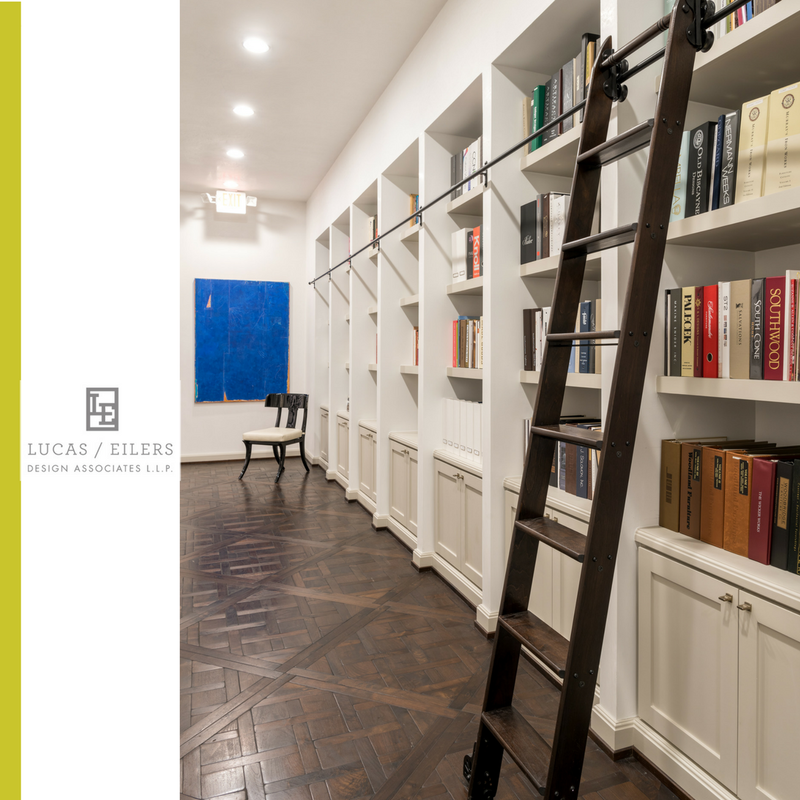 L/E: We give our clients formal proposals, and, when appropriate, we include printed floor plans and drawings which are sent to them via email or given to them, whichever they prefer. 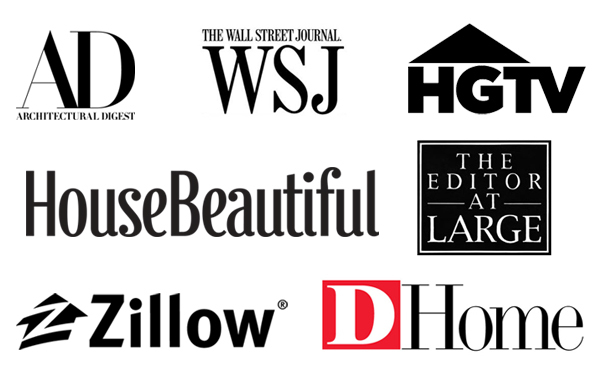 We would like to say thank you to our many clients over the years who have allowed us the privilege of helping them create homes meant to last for generations, and we are also grateful to our team, which includes our own in-house design team as well as the many artisans and vendor partners we work with who help make what we do look effortless. 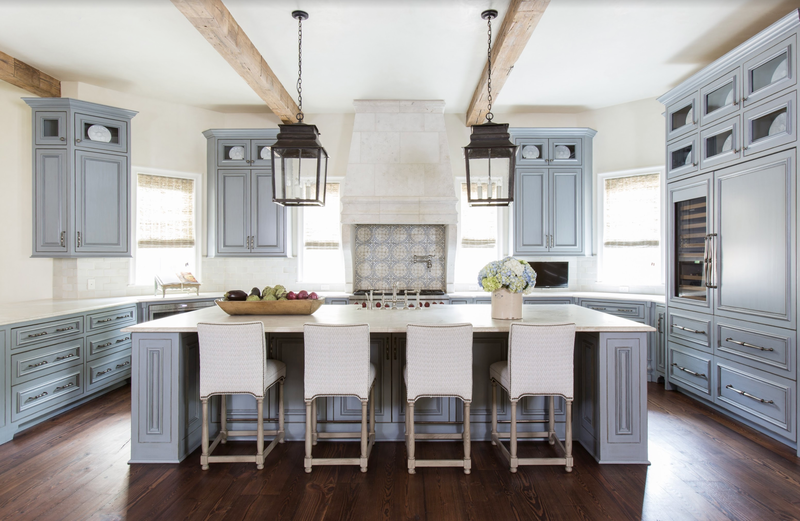 And lastly, we would like to say how grateful we are to the editors and bloggers who have published our work, like this kitchen we designed, below, published on the site of Luxe Magazine, earlier this year. Thank you, dear Hadley Court readers, for following along with our 6 part series this year, “The Inspiring Workspaces of America’s Top Designers.” We hope you’ve enjoyed every post, and invite you to share with us, in the comments, if you now have plans, in 2018, to transform your own workspaces, based on being inspired by what you’ve seen from 6 of America’s top interior designers! We wish each of you a very Happy New Year! What gorgeous offices! Probably the nicest I’ve seen, thanks for the profile. I attended BlogTour KBIS’17 with Sarah. Love their work so much! Thank you for sharing this beautiful space and the thought behind it!